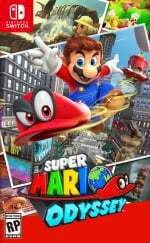 If you're one of the many people who purchased Super Mario Odyssey last week then chances are you're already gripped by the desire to find as many Power Moons as possible. These collectable items are key to the game's longevity, and are hidden away all over each of its varied worlds. The trouble is, the map doesn't actually tell you where they are. Sure, the locations of some will pop up at certain points but the vast majority don't get marked on the map until you either ask a friendly Toad to point them out (for a 50 coin fee) or use an amiibo - the latter being a much better option, even if many players totally overlook it. We're loathe to call this a "hint" because Uncle amiibo - the robot who makes this process possible - is easy enough to find on each level. Chat with him and he'll ask if you want to tap an amiibo character. Do this, and he'll send that amiibo off into the level to find the location of a Power Moon. 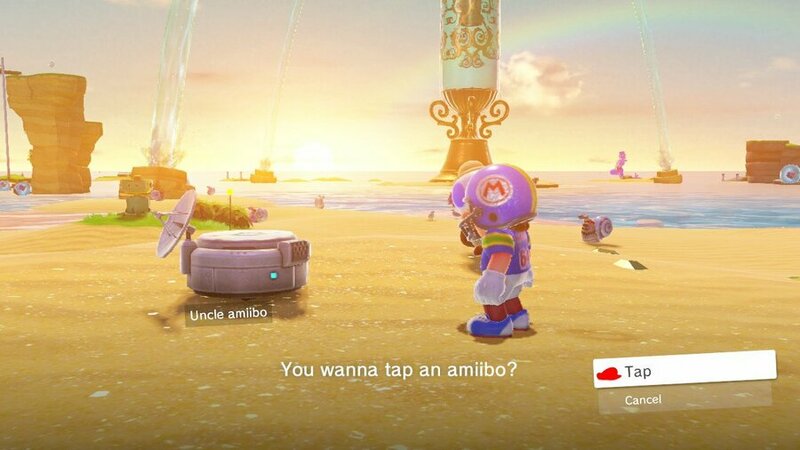 The catch is that it takes five minutes for the location to be confirmed, but on the upside you can tap up to three amiibo at any one time. Return to Uncle amiibo when the time has elapsed and he'll update your map. You can then send three amiibo back out into the level to find more. Using this method, it's possible to unearth the locations of many Power Moons in a short space of time. Given that many Nintendo fans have an aversion to amiibo it's quite possible that they will unfairly ignore this mechanic, but it's another way Nintendo is making those NFC-enabled figures valuable. We honestly don't know where we'd be without it in our quest to find all the Power Moons. It should also be noted that certain amiibo give you bonuses in game - so be sure to try all of yours out. Yeah, found this out too! Love the amiibo content in this game. I used the 10 amiibo that unlock outfits, and all of them showed me the location of a power moon on the map. Some of them were still really hard to find though because they might've been inside a cliff or something and you had to find a secret door to get in, stuff like that. But by far the most useful amiibo is Wedding Peach. Whenever I'm down to one slice of life and don't feel like dying, I scan Peach and she gives me a full 6 life wheel. I believe it works with any Peach amiibo too, actually. No use limit, no time limit between uses. Mario grants 30 seconds invincibility, and Bower makes purple coins highlight in the world- not on the map but in the real world. It gives you 3 extra lives. With regard to this story, paying for hints, eh. Whatever next? 50 coins are easy to get. I am sitting on 4500 coins and I'm no where near finishing the main storyline. The other option is paying for amiibo or buying the standard or limited edition game guide book. So far I am just using the parrot and treating the Power Moon name as a cryptic puzzle I have to work out. whats the point??? no sense of achievement when you get helpers finding the moons for you. how is this fun ? explain ? @flip9000 because some work many hours a week and do not have time to pour over every inch of the game to find them. However they stipp want to enjoy the game. Back when I was little I searched for everything, and didn't like hints. However, these days I'd rather just enjoy the content. I don't have the game yet, but if I ever feel like I need help getting a Power Moon, I'll just pay the 50 in-game coins. That seems a whole deal more fair to me. Sounds like a Mexican relative introduced into a struggling sitcom. This is a pretty clever use for them. Much better than locking content behind them. Nobody without Amiibo misses out on anything. I'm trying to avoid even asking toad wherever possible. It's definitely a game that's more fun to explore and investigate what catches your eye naturally. Maybe I'll resort to AssCreed-style "tell me where to go next" completionism if I start to get bored in a month or two and still have a few moons left to go. "But by far the most useful amiibo is Wedding Peach. " Btw, have you ever used Wedding Dress + Tiara for Mario ? Negative. It's about as goofy as Link in the Gurudo outfit. Not how I roll. Used an amiibo, Silver Mario which gives a gold Mario skin b/c NintedoLogic, and I was surprised Uncle amiibo told me where a moon was when I got into the next world, not the one I used him in. It was a moon just siting above a pile of rocks. I wont' say where b/c spoilers, but I suppose you're supposed to jump on the rocks at random? That's pretty weird. My Skylanders Bowser amiibo gave me 3 coins, my SM Peach gave me the hearts. I can see myself going back to that one a lot, I'm not a big fan of dieing. Though I don't dislike like it so much I'll play this game on easy assist mode, even I have my limits. So maybe in a month or so when I'm down to 1 or 2 moons on each world I'll whip out the amiibo if I'm feeling the need to complete anything, or Peach for a boss fight, but the hints seem kind of pointless early on in the game, I don't want them giving away stuff until I've searched every nook and cranny myself. I do miss my $20 green line from the Zelda BotW map to watch my tracks, but the quick travel flags and moon locations and dates is a nice trade-off. @JaxonH So you really are taking them out of the box and using them, huh? I know you told me you were, but I thought that was in some distant hypothetical future when you ran out of amiibo box space. Is your desk at work filled with them? My wife has a few toys scattered about her cubicle. Which reminds me, you steered clear of Skylanders, Lego D and DI figures, correct? We have all 4, so our finances got spread thin that way. @the8thark I only discovered the parrot last night. I think that's the best way to go - the Mario64-esque single sentence description without an 'x marks the spot' to make it too obvious. @rjejr There are paintings to other worlds that are remote locations with just 1 power moon. I’ve gotten 350+ with no hints. I think I’m going to find them on my own because it’ll feel like I’ve actually achieved something. How many moons are there total? 500? Edit: Googled total moon count. Wow. This’ll take a while. Alot of moons you'll see a glowing spot on the ground, or, you'll feel it with HD Rumble. It'll pan from left to right to left and get stronger depending where you're standing, and when you're right on top both will vibrate and it'll be strong. The HD Rumble and how it's integrated into gameplay is amazing. Absolutely amazing. I strongly recommend playing with split joycon. Not only is this the best way to truly feel the rumble (It's muted when playing in grip or handheld or pro controller, really need one in each hand) It's also much more conducive to the motion controls. And, it's just more versatile and comfortable. In Jax's opinion anyways. Now that T2L is dead, maybe that means those funds can be directed toward buying more games! You've got a long list of Switch titles you need to catch up on. @riChchestM Yeah, I found the moon in New Donk City from Tosterona painting, and the painting under Fossil waterfall, but it's still blank. So I'm guessing I'll find most of the rest, I'm very painstakingly thorough looking. The only ones I tend to miss are invisible ones, if they are hiding in any nooks or crannies, I'll find them. My kid, who's a world or 2 ahead of me, was impressed how I just found moons everywhere - hint, cappy everything. @Kalmaro Even better, if you just hold the right directional pad anywhere in the map you can tap the Amiibo and get a random bonus like a star. Why the hell would you want them all found for you. Finding them and figuring out how to get to them is the best thing about this game, without having to figure out how to get them, the game would feel rather empty. Honestly the 50 coins is nothing, you can get hundreds of them playing the Festival in New Donk City. errr, before spending $45 dollars for 3 garbage Amiibos - I can just get the guide for 9.99. And look at the map. @Agramonte A pack of Animal Crossing amiibo cards would even be cheaper than the guide. @the8thark I'd save as many of those coins as you can for post game, you're gonna need wayyyyy more than that. @JaxonH I'm playing w/ split Joycon b/c it feels like the game was designed with that in mind. I'd prefer to play w/ a Pro though, and if they make a button press for the circle hat spin I'd consider it. They aren't nearly as bad as I thought they would be. Holding them, looking at my hands holding them, they're awful, but once I'm playing it just works. Which is really all that matters. Do you ever use those 2 black buttons on the attachments? I'm assuming they are really made for 2 player when they are on top. My fingers dotn' really like their placement, and there doesn't seem to be a need, but I'm only 5 hours in, haven't gone past the desert yet. I'll use the internet if I feel like it. I just talk to the bird (Talkatoo? ), usually those hints are enough, I've yet to have much trouble and I have over 500 moons. I used my old squid boy inkling amiibo and got a single coin. Yipee!!! @ShadJV Unless the post game is Grandmaster hard or the costumes cost thousands of coins each, maybe not. I'll not ignore your advice but I shall see eventually if it's actually useful within the context of the game. @rjejr I just use the pro controller and the game works very well with that. Honestly there's not much you need motion controls for. The higher jump can be accessed by doing it right after a ground pound. The longer hat throw can be accessed by doibng a hat through right after a ground pound. Throwing your hat upwards is nice and can be done with the pro controller (though tough) I have never seen a use for it. @the8thark just offering friendly spoiler free advice, I am now in the position where I need to grind for tens of thousands of coins, and I had over 6000 coins by the halfway point of the game. Used them a few times, most of time I can find them pretty easy though with the parrot. I find all I can per level then move on, I'll go back to them later. @ShadJV Fair enough and thanks. it seems this game does have a lot of post game legs. Which is a good thing. @the8thark The up and down throws are kind of weird. I'm still holding out hope for some non-motion controls. Did you know Nintnedo updated NSMBU to have Pro controller support after release? So there's a precedent of sorts. Maybe when Odyssey gets playable Luigi DLC. Oh goodness no, I don't use attachments. No need. They just make the joycon horrible to hold. I use them naked and bare- they melt right into your hands that way. @rjejr The game is really playable now with the pro controller. Just a couple of pointless moves you can't do with the pro controlelr easily. I despair over amiibo. It's like Nintendo realised how much gamers hate IAPs to unlock content already in the game files, and decided manufacturing a bunch of cheap plastic toys was the answer. A lose for gamers who end up paying for content in premium games, and have space taken up frivolously with NFC chips in their handheld console, and a lose for Earth from the resources to make and transport all this plastic junk that will end up in landfills. Anyway, I think given the sheer number of Power Moons, it makes perfect sense for Nintendo to offer a number of ways to find them all. Otherwise, we'd have another DK64 on our hands (which I personally liked but, as some have said, some people have lives and such and don't want to sink hundreds of ours finding one last trinket). @the8thark Not being able to do those couple of pointless moves would annoy me, I'm easily annoyed, and interfere with my enjoyment of the game. Better to just play it is as it was intended. And we'll get another Year of Luigi once they figure out the best way to monetize it. @JaxonH No attachments you say? I don't think I've owned the system long enough to try that yet, I've only played Mario twice. Well 4x counting Target, and Target has the attachments on. I'll give it a go tonight. Would make life easier, for whatever reason those attachments are much more difficult to get on and off than the Switch and Joycon. Oh, you'll be happy to know for the first time ever my kid called from school to tell me his friend was coming over, they're playing co-op Mario now. Maybe I can make my home Switchworld East. Hey, franchising is where it's at. @JaxonH I'll mail you your cut of all my Switch commissions. I’ll have to tap all my unpackaged amiibo then! Love this damn game!! Wait, many Nintendo fans have an aversion to Amiibo? What the heck are you talking about? Then who was I competing with when trying to buy mine??? Sony fans? Martians? Republicans? I know some people don't like them but considering how they sold like cold water on a hot Arizona summer day, clearly a LOT MORE people like them. I still say Nintendo had the right idea with toys to life. Why tie them to one game? Spread out support and they become a better value.